I?m getting really fed up with hearing about cyclists? blood being spilled on Milwaukee Avenue in Chicago’s Wicker Park and Logan Square neighborhoods from dooring crashes that might have been prevented by protected bike lanes. Milwaukee, which leads northwest from downtown to these bike-friendly areas, is the city’s most popular cycling street, with as many as 14,000 bike trips per day. On Friday February 28, Dustin Valenta, 27, was doored by a female driver in Wicker Park, hurling him into the road, where he was run over by a truck driver who fled the scene. The back of his skull, his pelvis, a shoulder blade, and 23 of 24 ribs were fractured, and he sustained a punctured lung and lacerated shoulder. 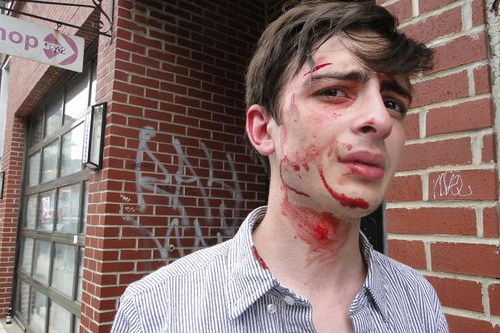 Then on June 25, around 3:15 p.m. Colin Croom, 22, went over his handlebars and onto his head after a driver opened his door in the cyclist’s path in front of a sub shop a block north of Valenta’s crash site. The driver, Michael Choi, said he ?did not see? Croom. 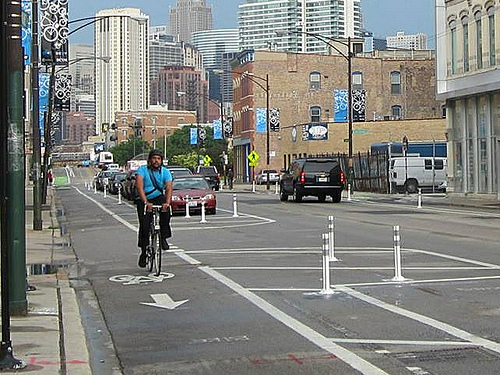 Thanks to stiffer penalties under Chicago’s recently passed Bike Safety Ordinance 2013, Choi will likely be fined $1,000. Fortunately, Croom wasn’t seriously injured, but he did require several stitches for a gash in his forehead and he lost wages due to having to take a few days off of work. DNA Info’s Alisa Hauser wrote a well-researched article about the crash. When I saw the photo that accompanied the piece, of Croom with his face covered in blood, I felt angry. Last month the city completed a high-quality protected bike lane on Milwaukee between in River West, a district just southeast of Wicker Park and Logan Square, which required removing about half the car-parking spaces. The Chicago Department of Transportation plans to replace some of the spots by implementing diagonal parking on side streets. This was a big improvement, but a map of dooring crashes reported from 2009 through September 7, 2012, shows there were almost zero reported doorings on this stretch. Meanwhile, the map shows dozens of doorings on Milwaukee in Wicker Park and Logan Square during this period. The higher incidence of doorings on Milwaukee in these neighborhoods is probably due to the fact Milwaukee is generally narrower there, with a higher density of retail and a high demand for curbside parking. These qualities also make it more difficult to extend the existing protected lanes northwest. However, moving the parking lanes to the left of the bike lanes and/or adding a wide, striped buffer with flexible posts to the left of the lanes, could help prevent more bloodshed. CDOT’s Streets for Cycling Plan 2020 has designated Milwaukee as bicycle-priority ?Spoke Route,? so it’s only common sense that bike safety should be paramount here. Stripping parking from Milwaukee in Wicker Park to make room for protected lanes is not a new concept. 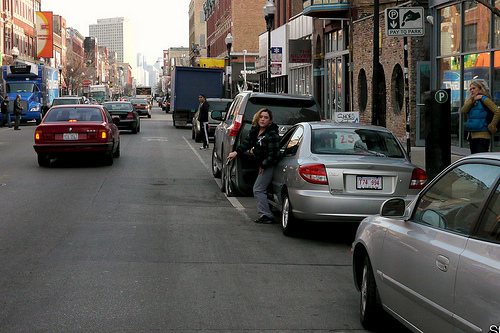 At an Active Transportation Alliance forum in early 2011, First Ward Alderman Joe Moreno, whose district includes part of Wicker Park, said he was interested in the idea, even if it meant incurring the wrath of the city’s parking meter concessionaire. Moreno added that the lost spaces could possibly be replaced with a new parking garage along the business district. In April, 32nd Ward Alderman Scott Waguespack, Wicker Park’s other City Council rep, who recently told CBS News he’s been doored or hit on a bike several times, asked the Wicker Park Committee neighborhood group to take an advisory vote on installing protected lanes on Milwaukee in the neighborhood, noting that this would require stripping about half of the parking spaces. Members voted 15-8 against the lanes. Waguespack’s spokesman Paul Sajovec told DNA at the time that the alderman was still trying to determine if there is sufficent support for protected lanes. With the recent Divvy bike-share launch, two-wheeled traffic on Milwaukee is only going to increase, and that photo of Croom hammered home the point that we can’t afford to wait any longer for safer bike conditions. CDOT needs to consolidate parking spaces along Milwaukee or, better yet, improve pedestrian and transit access so the spaces won?t be missed, and make room for protected bike lanes. The time to act is now, before a fatal crash makes the need for safer biking conditions even more painfully obvious.